The Americans with Disabilities Act is 26-years-old. And today, federal contractors are showing early progress in hiring people with disabilities. It was about this time three years ago that U.S. federal contractors learned of new rules from the Labor Department concerning the employment of qualified workers with disabilities and protected veterans. The new rules, the business community was told, would update 40-year-old federal policies to enhance job opportunities for people with disabilities and veterans. It represented the first time the federal government would create specific metrics to measure federal contractors’ progress toward achieving equal employment opportunity. With approximately 1 out of 4 U.S. companies being a federal contractor, this was a big deal. So three years later, it’s worth asking: How are things working out? I will admit to having had some conflicting thoughts at the outset. On the one hand, I sympathized with the business community, which raised valid concerns about aggressive new employment targets. There had never been a requirement for employers to hire a certain percentage of veterans or people with disabilities – now they were being told the goal would be 7 percent. But as chair of the National Organization on Disability, I also knew that, as a society, we must do more to find ways to connect talented men and women with disabilities to job opportunities. The unemployment rate for these Americans remains far too high, despite the fact that employers – once they have taken steps to hire people with disabilities – report that those people consistently rank among their best workers. Our success in the global economy depends, more than ever, on how well we inspire and put to use the talent and energies of every person in this country – every talent, every skill, every ability. That is why the National Organization on Disability was created – to see to it that no ability is wasted, and that everyone has a full and equal chance to play a part in our national progress. In a conversation I had with President George H.W. Bush last year, on the occasion of the 25th anniversary of the Americans with Disabilities Act, he said it best when he told me it simply comes down to those who have the jobs giving these workers a chance. It is worth noting that when Bush – a proud conservative – signed the ADA into law on July 26, 1990, he specifically challenged the business community, saying they alone held the key for unlocking the success of the ADA. At the end of the day, I was able to set aside any apprehensions I held largely because of the good work done by the Labor Department’s Office of Federal Contract Compliance Programs. To their credit, OFCCP listened to the concerns of contractors and provided additional time to implement the new requirements. And they decreased an employer’s burden on record keeping, too. They were smart to work in partnership with the business community to find solutions. I’m pleased to report that we already are beginning to see signs of progress. Slow and incremental for sure, but progress nonetheless. The National Organization on Disability recently shared new data from its 2016 Disability Employment Tracker. The survey showed 16 percent of respondents have achieved the 7 percent utilization goal, up from just 9 percent in 2015. What’s more, the study revealed that in contrast to previous years, three quarters of 2016 respondents – 78 percent of which are federal contractors – currently track the number of employees with disabilities that have been hired in the past year. It’s also worth noting that 20 percent of companies who took the tracker assessment are not federal contractors, which signals the new federal regulations may be offering guidance to the noncontractor business community, which would be welcome news. I had hoped after several years we might have seen even greater results. But we knew this was a process that would take time. Despite some initial concerns, I strongly believe it is an investment in time worth making. 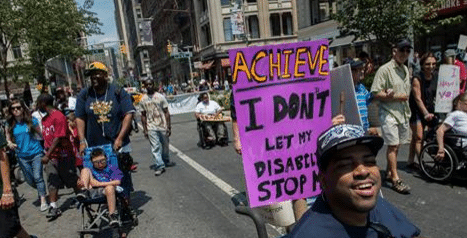 Tens of millions of working-age Americans with disabilities are able and eager to work. By joining forces with employers and the 24 million working-age Americans with disabilities who are not working, we can harness the talent of every willing worker and vastly expand the productive power of the national labor force.